Thanks for clicking in and giving us a visit. I trust that you are finding the information you need. If not, feel free to either give us a call at the office (541-258-5315) or email us at info@valleylifechurch.net and we will answer any questions that you have as quickly as we can. You can also view our most Frequently Asked Questions here. My name is Patrick Bowler and I am the Preaching Pastor here at Valley Life. We are a young church in the valley and are excited about what God is doing for His name’s sake and His glory here. Valley Life is a community of communities. We are re-born men and women who claim no righteousness of our own… Jesus Christ is our righteousness; so we are His. As a collection of Christ’s disciples we are doing the work of disciple-making, one life at a time, from house to house. We are a part of the Acts 29 Network of churches (more info here) and take very seriously the mission of Jesus in the world. “Make disciples,” Jesus said; and we want to do exactly that. 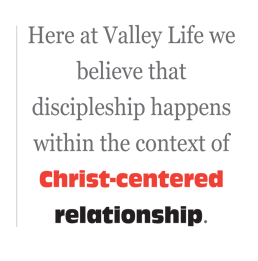 Here at Valley Life we believe that discipleship happens within the context of Christ-centered relationship. It is in these Christ-centered relationships where we are challenged and spurred on for growth (Heb. 10:24; Prov. 27:17). Jesus made disciples this way; therefore, so will we. Here at Valley Life we have a high view of scripture which directly impacts our preaching around here. We typically study through entire books of the Bible, chapter by chapter, verse by verse. We make no apologies for what scripture says. It is the inspired Word of God and therefore our authority (2 Tim. 3:16). If this is your heart as well, then I invite you to come and journey alongside us. May God bless you as you seek Him.